Co-founders Marshall Louis and Herman Beckley, brewers of Herman Marshall Texas Bourbon Whiskey, came to the Dallas SBDC in Garland to learn how to develop a marketing strategy to help them position themselves as the next best Whiskey brewing company. They were a start-up company planning their debut in the competitive landscape of boutique distillery. The two had met at Starbucks about 12 years prior, became fast friends, and started making whiskey. The product’s quality and quantity escalated to the point where they knew it was time to turn the hobby into a business. Louis’s background includes wine-making in South Africa and Beckley was a passionate hobbyist before the two teamed up. 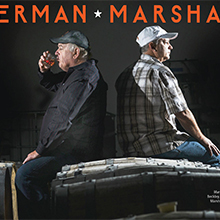 Several years ago, they started Dallas Distilleries and out of that, the Herman Marshall brand. Herman and Marshall had sourced a few advertising agencies before coming the Dallas SBDC in Garland because they knew brand development would be critical to their success. However, they quickly learned from Judith Collins, the Dallas SBDC advisor, that identifying the right target market was essential to brand development and without this analysis their marketing strategy would lose its impact. She advised them that they needed to develop a precise profile of their target market; to the point where they could completely visualize a person who would drink Herman Marshall Whiskey. Once they could pinpoint and visual their ideal customer, the look and feel of the brand emerged with little effort. A number of popular Dallas restaurants, pubs and bars are already pouring Herman Marshall Whiskey, including The Londoner, Christies Sports Bar and Grill, the Standard Pour and Bryan Street Tavern, just to name a few. The whiskey is also available local liquor retailers like Goody Goody, Spec’s, Sigel’s and Cheers. Earlier in 2013, the spirit earned a silver medal in the straight bourbon category at the prestigious, blind-tasted American Distilling Institute 7th Annual Judging of Artisan American Spirits.